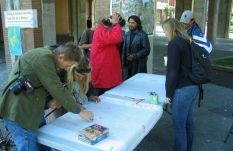 The purpose of this project was to conduct a participatory base line survey (census) among binners in Victoria to gain a better understanding of the extent and diversity of this community and to record the assets and barriers that binners face during their work. This project will help shed light on quality of life issues regarding this population and will contribute to defining appropriate public policies that can tackle the social and economic needs of these people and that are integrated in the local community development. 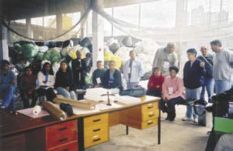 The Binning census was administered by participating binners and members of the Community-based Research Laboratory (CBRL) at selected bottle depots in Victoria during the week of June 18th to June 22nd 2007. Recently, members of the CBRL and Lifecycles hosted a community-mapping event at Centennial Square entitled ‘building a better world, one bin at a time’. Participating binners were encouraged to identify access (and barriers) to services, facilities and resources that are important in their daily lives. This was also an opportunity for binners and community members to network, share stories and participate in building an inclusive and healthy community. 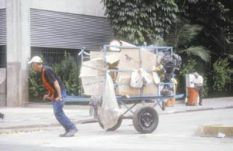 Binning is a common phenomenon particularly in poor countries and it is becoming more widespread also in the North. It is estimated that there are at least 100 binners (informal recyclers) in Victoria today. The value redeemed from the bottles remains an important source of income for them, many of who are homeless. As scavenging through garbage bins remains an illegal activity, their actions are not without confrontation. Frequent encounters with police lead to fines or arrests. Also, humiliation towards them is a common reaction from the community at large. However, binning provides the ability to become independent, without having to resort to begging or crime. Individual community initiatives in Vancouver are already working to eliminate the negative stigma that is attached to binning, to empower the binners and to improve their image. The United We Can bottle depot (www.unitedwecan.ca) in Downtown Eastside Vancouver, a social enterprise, plays an important role in improving the public image of Binners and in strengthening the cohesion among them. Key leaders from the Vancouver initiatives were invited to participate in this project for experience sharing and learning. 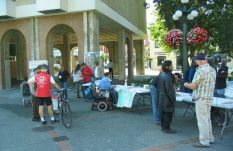 First contacts between the binning communities in Vancouver and Victoria have been made and the dialogue between government, society and binners in Victoria and Vancouver has been initiated over the past months. Victoria participants include Tony Hoar, of Tony’s Traylers and representatives of the binning community, among other partners in business, community and government. The research aims to improve the livelihood strategies of binners by generating awareness in our community about the benefits from strong partnerships between consumers and binners, and by restoring the dignity and integrity of binners that is often challenged by society’s negative perception. For more information on this project please contact Jutta Gutberlet (juttag at uvic.ca), Crystal Tremblay (crystalt at uvic.ca) or Julian Yates (jsyates at uvic.ca).